Weak acid soils with pH values of 5.0-6.5 are ideal. Strawberry varieties are subdivided into so-called single flowering summer varieties and repeat flowering (day-neutral) varieties. Repeat flowering varieties can flower throughout the entire year, if light and temperatures are appropriate. Thus, they enable strawberry cultivation almost year-round. Higher nitrogen requirement in the first year for plant growth. Best nutrient absorption in a slightly acidic environment. Avoid chloride in the fertilizer. The potassium supply is important. Fresh seedlings (bare-root or with balled-root) are planted from mid-July to mid-August. Irrigation is necessary as the water demand is high after planting. The yields are slightly lower, are of higher quality and make for earlier harvests. Frigo seedlings are rooted out from November to January and then stored at -1.5°C. They consist only of the heart, rhizome and roots (no foliage), and are then planted from the end of March to the beginning of June. In the field, strawberries are usually planted as a two-year crop, as the incidence of disease increases significantly thereafter. Soil analysis at a depth of 0-30 cm is recommended, to determine the fertilizer requirement. At strawberry locations, there is a Nmin target value of 60kg N/ha at planting, in spring and post-harvest period, if there is to be another crop in the following year. 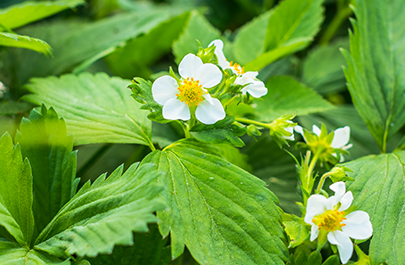 Since strawberries are very sensitive to salt, fertilizers containing chloride should be avoided, and several smaller fertilizer applications should be done. A slightly acidic environment facilitates the uptake of micronutrients such as iron (Fe) and manganese (Mn). Demand for potassium is remarkably high. In addition to yield production, potassium also influences taste due to its effect on the sugar and acid balance of the plant. In terms of quantity, fertilization is based on how much is supplied by the soil and the quantities extracted. The table shows uptake and removal per tonne of strawberry yield. According to this, strawberries mainly need nitrogen, potash and magnesium. For example, a strawberry yield of 20t/ha takes up 120kg N/ha. If 30kg N/ha is supplied by the soil, then 90kg N/ha would need to be fertilized. The harvest removes 60kg N/ha. 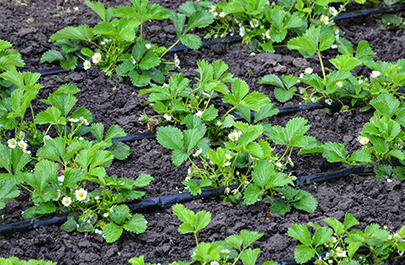 Strawberries have an increased nitrogen requirement during growth and fruit formation. They prefer ammonium nitrate, which is absorbed especially during the vegetative growth period. In cases of high temperatures or low pH, nitrate is preferred by the plant. Sufficient supply is necessary for yield formation, but an excessive nitrogen supply can cause problems such as excessive runner formation, increased susceptibility to disease, or increased sensitivity to low temperature. Nitrogen should always be added by applying topsoil, whereas phosphorus, potash and magnesium can be used for basal fertilization. Row fertilization is optimal for nitrogen application, especially in large row spacing. In order to stimulate root growth in the best possible way, incorporation of phosphate, either in combination with potash or as NPK fertilizer, before setting, is advantageous. In addition, the flowering behaviour is positively influenced by a sufficient supply of phosphorus. Potassium is important for fruit ripeness, fruit colour and sufficient supply to reduce the stress symptoms caused by drought and low temperatures. Regular calcium (Ca) applications are recommended, especially on sandy soils. Calcium is used for building cell walls and thus for better fruit strength. Likewise, calcium is necessary for optimal resistance to sodium toxicity and decreased susceptibility to botrytis. Calcium deficiency reduces the lifespan of strawberry plants. Beyond that, a sufficient lime supply supports the soil structure; strawberries are very sensitive to compaction and waterlogging. An adequate supply of magnesium (Mg) is important as a component of chlorophyll, needed for photosynthesis. The same goes for copper (Cu). Magnesium and copper also support the shelf life of fruits. 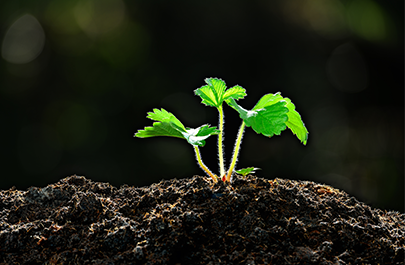 In order to stimulate root growth and to cover basic nutrient requirements, it is advisable to administer a portion of the nitrogen, as well as the full amount of phosphate, potassium and magnesium, via a chloride-free, potash-emphasised NPK fertilizer. The necessary amount of nitrogen is given as topsoil application. The fertilized nitrogen must be immediately available, especially in the case of repeat-flowering varieties. Nitrate-based fertilizers (NAC 27 N) are the best choice. Trace elements are applied in liquid form, usually combined with crop protection measures. Since strawberries are easily dehydrated which leads to significant losses in yield and quality, strawberries are irrigated very frequently. The continuous supply of water facilitates continuous nutrient supply through fertigation adapted to the state of development of the plant. Since strawberries prefer a salinity of 0.4-0.6mS/cm, the salt content of the fertilizer solution should not be higher than 1.25mS/cm. Covering the soil with straw or a film reduces watering requirements. Iron (Fe) and manganese (Mn) are both involved in photosynthesis and protein metabolism. Boron (B) is important for pollen fertility. These trace elements can be added in fertigation.